The Akbash, also known as the Coban Kopegi and the Akbas, was developed over 3000 years ago in what is now known as Turkey. The Akbash was developed by shepherds as a flock guard. Selective breeding was used by the shepherds to create the all white coat of the Akbash as a means to differentiate the dog from predators. 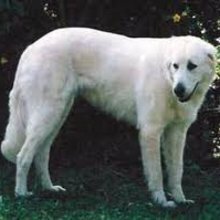 It is believed that the Akbash is a relative of the more recognizable flock guards of Europe such as the Komondor, Kuvasz, Tatra Mountain Sheepdog as well as the Pyrenean Mountain Dog. The Akbash is recognized by several kennel clubs including the NKC, UKC, CKC, ADI, APRI, ACR and DRA(Akbash Dogs International). The Akbash will typically reach heights of 28-32 inches tall and an average weight of 90-130 pounds. The Akbash, whose name in Turkish translates to “White head”, will always appear with a white coat. The Akbash's thick double coat is course and weather resistant and should appear in short to medium length. The Akbash is a very loyal and alert dog with a natural guarding instinct. The Akbash is a working dog that will prefer a lifestyle that offers him work to do on a regular basis. Also, the Akbash is an independent worker that does not require constant supervision to complete his tasks. Livestock Guardian dogs are independent minded and do not have a high desire to please people. The Akbash Dog is a serious working breed that is most happy with a job to do in a semi-rural or rural setting. The Akbash is typically wary of strangers and will be suspicious of even welcomed friends if they are not closely supervised by the owner. The Akbash is naturally dog aggressive and can become barrier frustration aggressive when surrounded by lights and sounds in town. The Akbash is a very loyal and alert dog with a natural guarding instinct. The Akbash is a working dog that will prefer a lifestyle that offers him work to do on a regular basis. Also, the Akbash is an independent worker that does not require constant supervision to complete his tasks. Livestock Guardian dogs are independent minded and do not have a high desire to please people. The Akbash Dog is a serious working breed that is most happy with a job to do in a semi-rural or rural setting. The Akbash is typically wary of strangers and will be suspicious of even welcomed friends if they are not closely supervised by the owner. The Akbash is naturally dog aggressive and can become barrier frustration aggressive when surrounded by lights and sounds in town. The Akbash is an extremely intelligent breed that is always highly dedicated to its family as well as the livestock it is charged with protecting. The Akbash also exhibits a strong maternal instinct, which makes them typically very good with infants or even the newborn animals of livestock on the farm. It is this sense of comfort that the livestock gains from the Akbash that causes them to collect behind the Akbash in the event of a threat. It is not uncommon for the Akbash to disregard self preservation in order to protect the livestock they've bonded to. The Akbash has been known to protect charges such as sheep, goats, cattle, horses, poultry, exotic birds, deer, alpacas, llamas and ward off predators such as wolves, bears and coyotes. In the right setting, with the right people, the Akbash Dog can be an excellent companion dog. For an Akbash Dog to succeed as a companion dog, owners must have the time and dedication to provide intensive and continual training and socialization for their dog. Companion dog owners should have a better than average understanding of canine behavior. Akbash dogs take their job of guarding very seriously and need to be well socialized and trained right from puppyhood. If raised with children or other pets, they will be very protective. You can find Akbash puppies priced from $400 USD to $800 USD with one of our credible breeders. Browse through our breeder's listings and find your perfect puppy at the perfect price. The Akbash is an extremely intelligent breed that is always highly dedicated to its family as well as the livestock it is charged with protecting. The Akbash also exhibits a strong maternal instinct, which makes them typically very good with infants or even the newborn animals of livestock on the farm. It is this sense of comfort that the livestock gains from the Akbash that causes them to collect behind the Akbash in the event of a threat. It is not uncommon for the Akbash to disregard self preservation in order to protect the livestock they've bonded to. The Akbash has been known to protect charges such as sheep, goats, cattle, horses, poultry, exotic birds, deer, alpacas, llamas and ward off predators such as wolves, bears and coyotes. In the right setting, with the right people, the Akbash Dog can be an excellent companion dog. For an Akbash Dog to succeed as a companion dog, owners must have the time and dedication to provide intensive and continual training and socialization for their dog. Companion dog owners should have a better than average understanding of canine behavior. Akbash dogs take their job of guarding very seriously and need to be well socialized and trained right from puppyhood. If raised with children or other pets, they will be very protective. The Akbash requires very little grooming as their coat is naturally non-matting and does not cause dog odor. They only require regular brushings to assist in removal of dead hair and a bath when necessary. The Akbash is considered an above average shedder. Also, the Akbash is not considered a good fit for apartment living. They are typically inactive indoors and require a large area for exercise daily. The Akbash is a very strong willed breed that will take control of any situation if allowed. This breed can be difficult to train and requires a strong minded and consistent pack master to follow. The Akbash does exhibit a natural guarding instinct and should require very little training to do his job. While the Akbash's activity level is relatively low, they are still a very athletic dog and will require a long walk daily if not provided space to play. A large yard or farm is the best environment for the Akbash, as this allows them to exercise themselves without assistance. Akbash Puppies for Sale - Shipped Worldwide! Finding the right Akbash puppy can be dog gone hard work. PuppyFind® provides a convenient and efficient means of selecting and purchasing the perfect Akbash puppy (or Akbash puppies) from the comfort of your home, 24 hours a day, 7 days a week. Take advantage of our PuppySearch or leisurely browse our directory of hundreds of dog breeds, Akbash dog breeders, Akbash dogs for adoption, and Akbash puppy for sale listings with photos and detailed descriptions. Some Akbash puppies for sale may be shipped Worldwide and include crate and veterinarian checkup. Many Akbash dog breeders with puppies for sale also offer a health guarantee. With thousands of Akbash puppies for sale and hundreds of Akbash dog breeders, you're sure to find the perfect Akbash puppy.